I've been working on a new color collection for some time now and I've finally settled on the shimmering metallics I like best! I may add more ;) I've seperated the original 3 metallic colors (gold, silver & copper) from the opaque color chart and added them to this NEW chart. Metallic gold is now called "New Gold". In addition to the rainbow of bright metallic colors, I'm offering a few brand new choices in metallic browns and a metallic gunmetal gray. 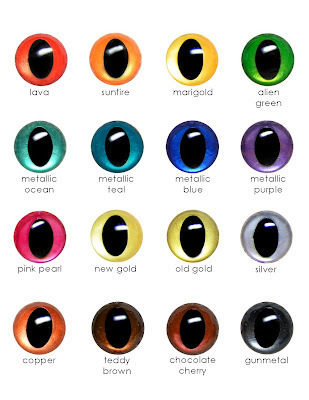 All of these new colors are available in all of the 10 round pupil sizes as well as the 5 oval cat pupil sizes. When time permits, I'll be adding these choices to all of the listings for my "made to order" packs. In the meantime, you can contact me on Etsy for a package that meets your needs.